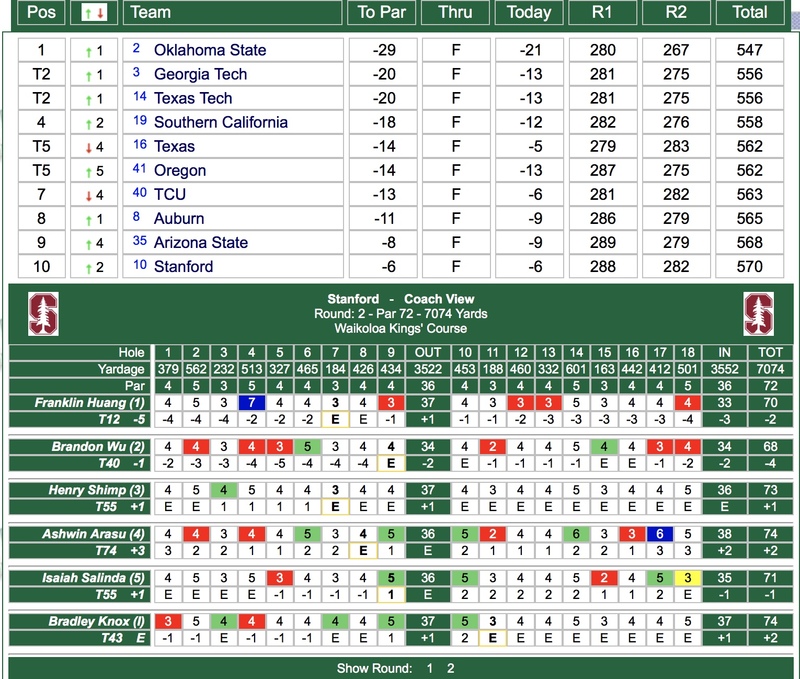 Stanford finished in 5th place, 6 strokes behind Oklahoma State as the event was shortened to two rounds following the first day cancellation due to high winds. 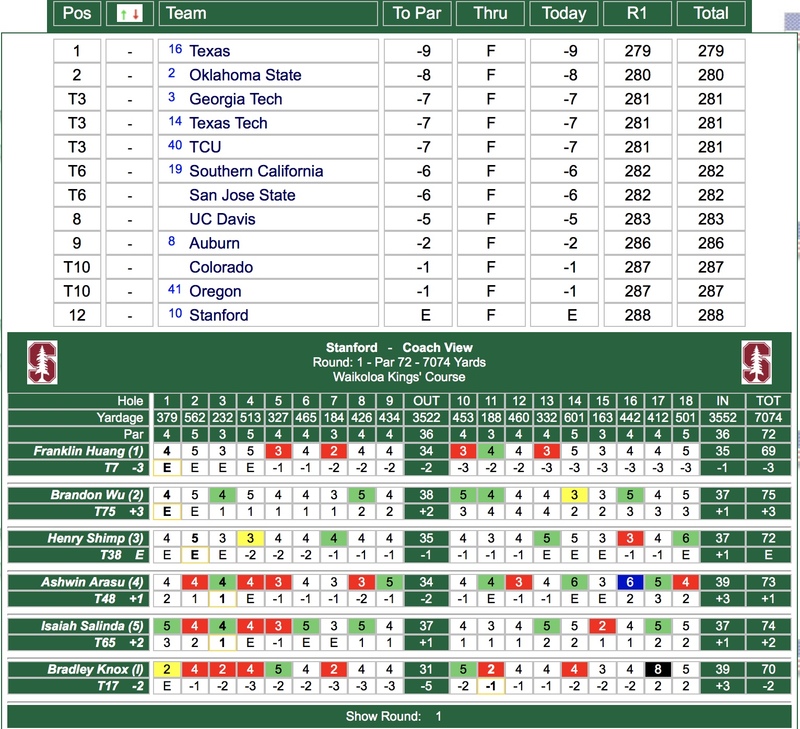 Second and final round scoring is shown below including scorecards for all 10 Stanford players who competed. Top finisher was Isaiah Salinda with 72-69 141 to finish tied for 7th. Isaiah Salinda and Franklin Huang each finished among the top 10 and the 12th-ranked Stanford men's golf team finished fifth in The Prestige at PGA West Resort, which was completed Wednesday. Co-hosted by the Cardinal and UC Davis, the tournament was reduced to 36 holes after the first round was cancelled due to high winds. Sixteen teams and 15 schools competed in the event. Stanford started strong Wednesday at the Greg Norman Course and surged into the lead midway through the back nine but couldn't sustain it. The Cardinal closed with a 3-over par score of 287 to conclude at 5-over 573. The Stanford B squad tied for 10th at 28-over 596. Second-ranked Oklahoma State rallied for a one-shot victory over Pepperdine, combing for a 36-hole total of 1-under 567. Clay Feagler of Pepperdine claimed the individual title with a score of 7-under 135, closing with a 66. Fueled by two eagles, Salinda recorded a 2-under 69 and tied for seventh at 1-under 141. He made treys at the par-5 eighth and 16th holes, and added two birdies to match his best finish of the season. After opening with a 3-under 68, Huang followed with a 75 and earned a share of 10th at 1-over 143. It marked his second top 10 of the season. Junior Brandon Wu toured the front nine in 2-under and birdied 10 and 11 to reach 4-under. He tallied five birdies and shot 69 to tie for 18th at 2-over 144. Sophomore Henry Shimp (77) tied for 36th at 6-over 148, while senior Jeffrey Swegle collected the last of four birdies at the par-4 18th hole to shoot 74 and tied for 42nd at 7-over 149. The B team was led by freshman Ashwin Arasu, who made four birdies Wednesday and posted his second straight 73 to finish at 4-over 146, tying for 28th. Senior Bradley Knox shot 72-76 and tied for 36th at 6-over 148. Sophomore David Snyder (77-73) tied for 46th, junior Chris Meyers (76-76) tied for 57th, and sophomore Dakota McNealy placed 83rd. Stanford returns to competition March 4-6 in the Cabo Collegiate at Querencia in Los Cabos, Mexico. Round 1 delayed due to high winds when scheduled. 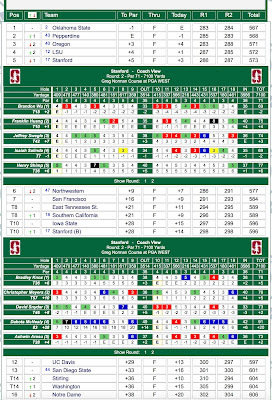 Full scoring including Stanford scorecards are shown below. WAIKOLOA, Hawaii - Behind Franklin Huang’s 3-under-par performance Saturday, Stanford wrapped up its spring opener by placing 10th among 18 teams at the Amer Ari Invitational. Huang (69-70-69) finished under par in each of his three rounds during the 54-hole event, tying for 13th among individuals on the par-72 Waikoloa Kings’ Course. Stanford (288-282-282) was 6-under Saturday for the second consecutive round, finishing at 12-under overall. 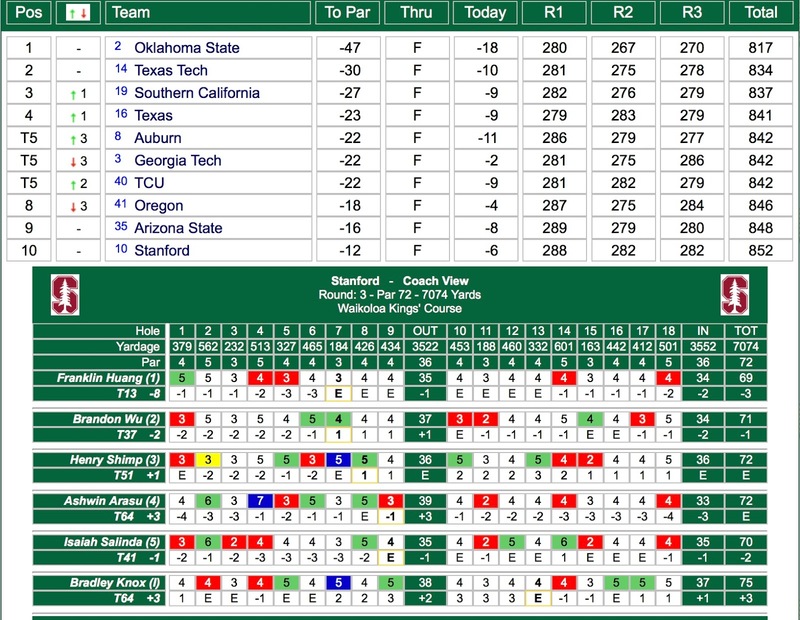 Top-ranked Oklahoma State (-47) won the event. USC’s Justin Suh (-13) claimed medalist honors. "I’m proud of our guys and how they hung in there to knock off our winter rust while playing against some of the top teams in the country on Bermuda grass and against Hawaiian winds," said Conrad Ray, Stanford’s Knowles Family Director of Men’s Golf. "There were a lot of different variables and challenges on the course, and without question we have a long way to go in all areas, but there were also some very positive signs of improvement. It was fun to see Franklin Huang have a very good week on the individual front and his game is trending the right way. 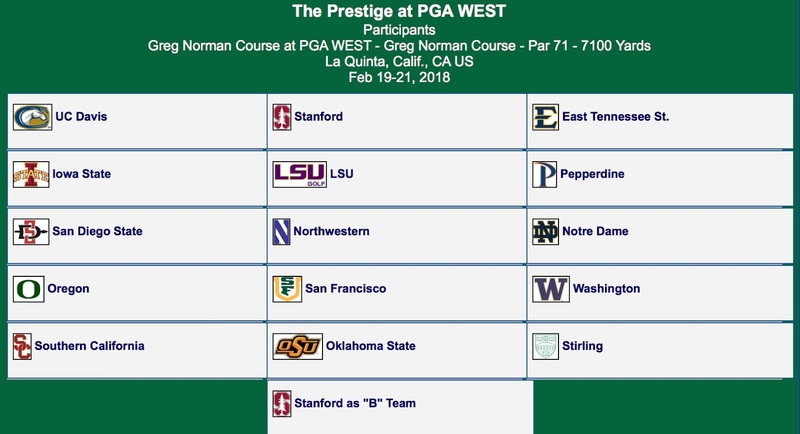 We’re excited to look ahead to the The Prestige at PGA West." Brandon Wu (75-68-71) tied for 37th at 2-under, logging four birdies in his final round. Isaiah Salinda (74-71-70) improved during each round and tied for 41st at 1-under. Henry Shimp (72-73-72) tied for 51st and Ashwin Arasu (73-74-72) tied for 64th. Shimp had a pair of eagles during the tournament. Bradley Knox (70-74-75) tied for 64th. Final round scorecards and top 10 team scoring are shown below. WAIKOLOA, Hawaii - Brandon Wu shaved seven strokes off of his opening-round score to help Stanford jump from 12th to 10th on Friday at the Amer Ari Invitational. Wu followed a 75 with a 4-under-par 68 while moving from 75th to 40th in the individual race. Franklin Huang shot a 2-under-par 70 (69-70 139 T12) to contribute to the Cardinal effort. Huang was 4-under -- and bogey-free -- through 15 before a double-bogey set him back. Huang is tied for 12th. 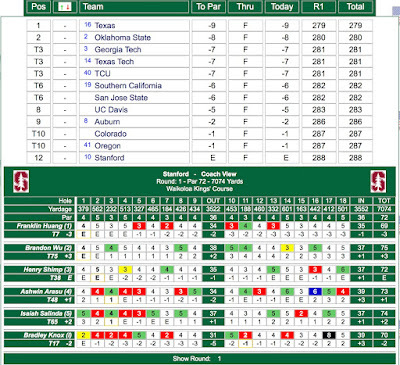 Stanford, currently 10th, went 6-under Friday after its opening-round performance of even-par. Oklahoma State went 21-under to take the team lead, nine strokes clear of second-place Georgia Tech and Texas Tech. 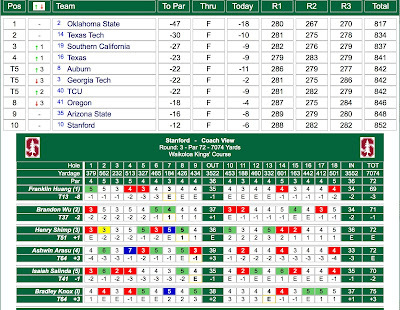 Oklahoma State's Hayden Wood leads the medalist race at 10-under. Henry Shimp (72-73 145 T55) went 1-over, and Isaiah Salinda (74-71 145 T55) was 1-under with the help of an eagle on the par-5 18th. Ashwin Arasu had four birdies but finished at 2-over. He is tied for 74th (73-74 146 T74). Bradley Knox (70-74 144 T43) was 2-over. Second round scorecards and top team scoring is shown below. WAIKOLOA, Hawaii - The Stanford men's golf team combined to post an even-par 288 Thursday in the opening round of the Amer Ari Invitational to christen the spring season. 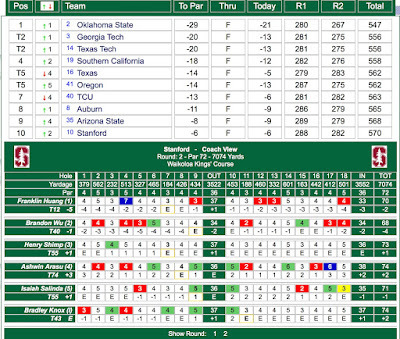 Texas leads the 18-team field at 9-under on the par-72 Waikoloa Kings' Course, with Stanford in 11th place. Franklin Huang recorded only one bogey and added four birdies to pace the Cardinal with a 3-under 69. Huang is tied for sixth. Ashwin Arasu managed six birdies during his round of 1-over for a share of 48th. Isaiah Salinda tied for 64th at 2-over. Henry Shimp managed an even-par 72 for 36th. Competing as an individual, Bradley Knox was 2-under through four and finished with a 2-under 70 for a share of 17th. He was 4-under on his final 10 holes. With a 3-over 75, Brandon Wu is tied for 76th. He eagled the par-5, 601-yard 14th. It was one of three eagles on the day for the Cardinal, as Shimp (par-5 fourth hole) and Knox (par-4 first hole) joined the club with Wu. • No. 11 Stanford starts the spring portion of its 2017-18 schedule this week at the Amer Ari Intercollegiate in Waikoloa, Hawaii. 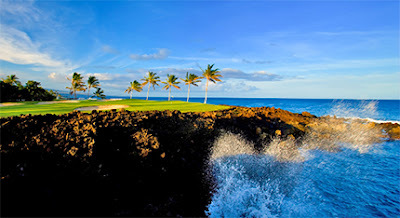 The three-day, 54-hole tournament is hosted by Hawaii-Hilo. 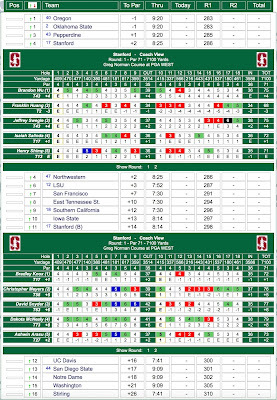 • Stanford’s only win in the event came in 2009, with Notah Begay (1995) claiming the Cardinal’s lone medalist honor. • Brandon Wu’s 69.32 scoring average ranks fourth nationally heading into the event. • Stanford posted four top-15 finishes during the fall portion of the 2017-18 season, including a pair of runner-up finishes (Nike Collegiate Invite and St. Mary’s Invitational). • Along with No. 11 Stanford, ranked programs among the 18-team field include No. 1 Oklahoma State, No. 5 Georgia Tech, No. 10 Auburn, No. 14 Texas Tech, No. 15 USC and No. 19 Texas. Arizona State, San Jose State, UC Davis, Hawaii-Hilo, Oregon, Pacific, Oregon State, TCU, Hawaii, Colorado and Osako Gakuin (Japan) round out the field. • Five teams have competed at every edition of this tournament since 1991 -- Oregon, TCU, USC, Hawaii-Manoa and Hawaii-Hilo. Numerous future PGA stars have played the Amer Ari Intercollegiate, including Tiger Woods, Jordan Spieth, Matt Kuchar and Notah Begay.